Walked by Ryu's Dining & Bar many times, almost always after meals but never when I was looking for food. 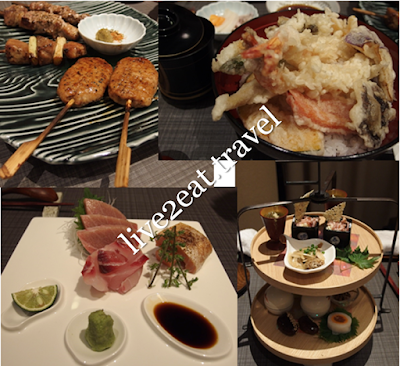 Reminded myself to try this Japanese restaurant, located on the 1st floor of Capitol Piazza beside Taiwanese Dazzling Café and Italian Equilibrium, and finally remembered last weekend. Made reservations for dinner, not that it was necessary but we did not want to make a wasted trip down. 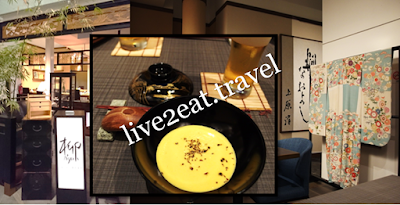 Started with a complimentary cold soup, followed by three types of sashimi from Tsukiji Market – thick slices of chutoro, long tail fish and sakuramasu (grilled) were fresh and succulent. While a dining companion was disappointed that the swordfish sashimi was not available, I loved how the charred taste accentuated the sakuramasu or cherry salmon. Tsunami Tree, an assortment of Japanese bites, was lovingly presented on a two-tiered display. 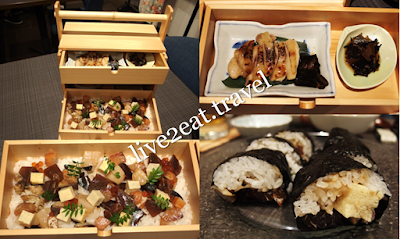 On the upper wooden tray were seaweed with minced ginger in a lacquered cup, bacon potato salad in a square container and mackerel with onions. And on the lower tray were ikan bilis in a small glass bowl, fish floss in white crucible with cover and raw tuna wrapped with carrot and turnip slices. The "pebble" is chestnut with sesame seeds for the added aroma. Everything was good, really. 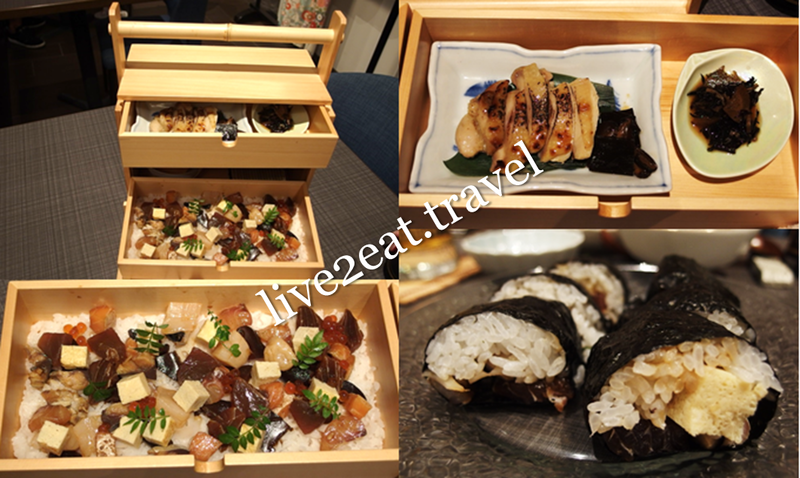 Okamochi Bara Chirashi-Sushi Set, meant for us to enjoy the DIY (do-it-yourself) sushi rolling experience, came in a beautiful wooden box with drawers. In the upper was grilled chicken with salad and the middle, barachirashi. No complaints about the latter though could not say the same of the former, supposedly marinated in three different stocks, as it was not as cooked as I would have liked it to be and hence a tad tough. Could neither rave about its Kushiyaki Platter consisting of two Tsukune chicken balls and one each of Iberian pork, lamb neck and tuna with leek nor fault the Special Ten Don Set. Tempuras – consisted of two shrimps, one sea eel and vegetables, were not too oily and its batter was not too thick.